Every summer we like to take at least one backcountry trip as a family, and whenever I get to choose the destination, there will always be a hut or cabin involved. I love backcountry cabin camping and find it much easier than tent camping for several reasons. This is part one of a two-part story. Part one will focus on why we LOVE backcountry cabin camping (and aims to hopefully inspire you to give it a try.) Part two will be the story of this year's backcountry trip to the Stanley Mitchell Hut in Yoho National Park. 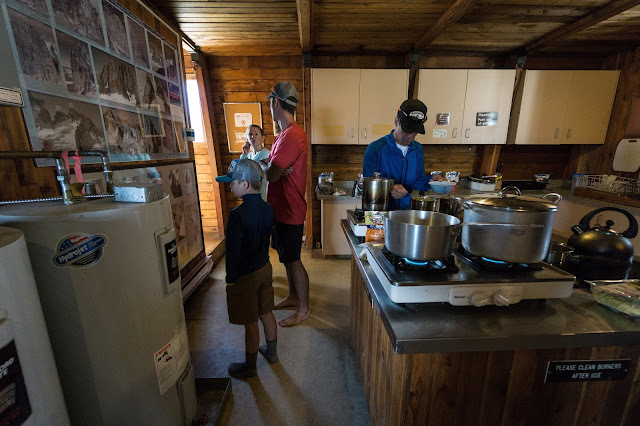 If you stay at an Alpine Club of Canada cabin or hut in the Canadian Rockies, you won't have to bring sleeping mattresses, a tent, a stove, dishes, or any cooking supplies. Each hut comes equipped with a basic kitchen, supplies, propane stoves and propane lights. Some even have ovens and most have wood stoves or fireplaces. The backcountry huts also have communal sleeping platforms with soft foam mattresses on them. Bring sleeping bags, food, and your basic overnight gear - and you're set! You Won't have to Worry about the Weather! I suspect we would have cancelled that trip if we would have been tent camping. Thanks to our warm cozy cabin though, we got to camp, dried out, played games and socialized in total comfort, and had a great weekend! 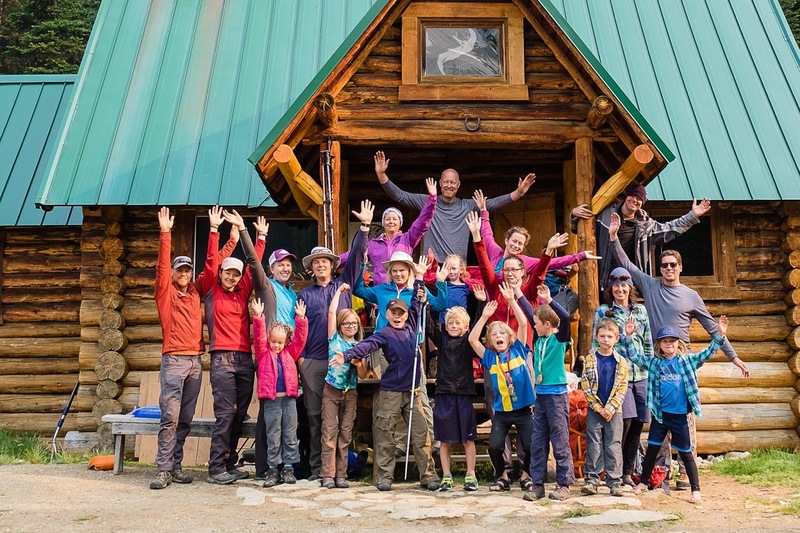 You can read about that trip here: Backcountry Cabin Camping with Kids - Elk Lakes Cabin, BC. We showed up at this cabin absolutely drenched and cold! Thank goodness for a wood stove! You can read about our September backpacking trip to Egypt Lake here, where we stayed in a Parks Canada backcountry shelter (more primitive than an Alpine Club Hut, but still equipped with a wood stove for heat:) Backcountry Banff with Kids - Egypt Lake. You can see all of the Alpine Club Huts here: Alpine Club of Canada Backcountry Huts. And you can read about our trip to the Asulkan Cabin here: Summer Backpacking Trip to the Asulkan Cabin, Rogers Pass. And brand new story - read about our 2017 trip to the Stanley Mitchell Hut, where we booked the entire hut for 6 families. With less gear required, a warm cabin to sleep in, a kitchen provided for you, and a comfortable living room to hang out in (complete with fireplace or wood stove,) you'll find backcountry cabin camping to be much more comfortable with young kids or friends that are new to backcountry camping. I know for myself, I always appreciate having to carry less gear! This alone makes the trip more enjoyable. Add the fact that I don't have to worry about rain or cold mornings/evenings, and I'm a happy camper when there's a cabin or hut involved. Alpine Club Cabins are Located in some Pretty Spectacular Places!! From our cabin, we've gone on amazing day hikes to places few families ever see. We even got to walk across a glacier last year from our base camp at the Conrad Kain Hut in the Bugaboos. Staying at a cabin overnight also makes those long day hikes more doable with kids. This year we hiked the world-famous Iceline Trail in Yoho National Park on our way out from the Stanley Mitchell Hut. Many adults do it as a long day hike, but with kids it was only feasible as part of an overnight stay at the hut or nearby campground. You Can Camp in the Backcountry Year Round! Yes, I know, some people do camp in tents year-round, but this mom does NOT. I require a few basic comforts if I'm going to ski or snowshoe to camp - one of them being heat, and another being four walls around me. I do not camp on snow either. Fortunately, we are very lucky here in the Canadian Rockies and there are many great cabins that families can ski or snowshoe into with young kids. Elizabeth Parker Hut, Yoho National Park, BC - Shuttle bus ride + a 10 minute hike in summer. 12 km ski or snowshoe up the road in winter. Stanley Mitchell Hut, Yoho National Park, BC - 10 km hike in summer. Not accessible with kids in winter. Elk Lakes Cabin, Elk Lakes Provincial Park, BC - Accessible from Peter Lougheed Provincial Park in Kananaskis via a 9 km hike or from Elk Lakes Provincial Park in BC by vehicle (long drive but no hiking involved at all.) In winter, you can ski or snowshoe the 9 km in to the cabin. You can not drive to the cabin in winter. A. O. Wheeler Hut, Glacier National Park, BC - You can pretty much drive to the hut in summer. In winter, it is a short 45 minute ski or snowshoe on a road. Asulkan Cabin, Glacier National Park, BC - 6.5 km hike with 700 metres of elevation gain. This trail is very steep so save the trip until your kids are a bit older. It is not accessible with kids in winter. Conrad Kain Hut, Bugaboo Provincial Park, BC - 4.6 km hike with 700 metres of elevation gain. This trail is very steep, there are narrow sections with hand cables, and there is a ladder to climb en route to the hut. Save the trip until your kids are a bit older. It is not accessible in winter. Kokanee Glacier Cabin, Kokanee Glacier Provincial Park, BC - 8.5 km hike in summer. Not accessible with kids in winter unless you take a helicopter in. Cameron Lake Cabin, Waterton Lakes National Park, AB - Winter use only. It is a 2 km ski or snowshoe on a groomed cross country ski trail. The Egypt Lake Shelter, operated by Parks Canada and located in Banff National Park. Accessible via a 12 - 13 km hike from Sunshine Village Resort. Accessible with kids in summer only. Cypress Hills Provincial Park Backcountry Huts, operated by Alberta Parks and located in Southern Alberta. We hiked 5 km into the Tom Trott Hut in winter on snow covered roads. In summer you can drive to the hut. There are three backcountry huts in Cypress Hills Provincial Park and five brand new cabins for summer use (Potentially winter too?) More information can be found here. The HI Hilda Creek Hostel, operated by Hostelling International, is another option for a winter backcountry adventure. This remote hostel is located on the Icefields Parkway in Banff National Park. It is a short 5 minute snowshoe into the hostel. The hostel only sleeps 6 people so it is very easy to book the whole thing for your own private wilderness retreat. And now published: This year's summer adventure to the Stanley Mitchell Hut. Great article Tanya (as usual)! You've inspired us to book our very first back country cabin trip up to Elk Lakes next summer. Have you ever tried biking in? I thought it might make the trip in a little easier and more fun for the kiddos. They will 7 & 9 next summer and both have good mountain bikes with gears. Also thought it might allow us to tow our supplies in a chariot instead of backpacks. We've never thought about biking in because my son hates biking uphill, lol. He's a true downhill biker. He'd never make it up to Elk Pass. It is a steep climb to make it to Elk Pass on a bike. Not sure if kids could do it (or would want to do it.) But that being said, probably depends on how strong your kids are. Maybe try some trial runs first. Day tripping up the Brewster Creek Trail, Cascade Fire road trail, or Red Earth Creek Trail. If they can do those, they could make it to Elk Pass. And if you hike, you can still choose to take a chariot with supplies. You just can't take the hiking trail in (which is much prettier.) If you have a chariot (or bikes) you have to take the power line in and out. The hiking trail is too narrow. Thanks for the insight Tanya. I don't think I realized how big of a hill it must be. If it's too much for your son it would surely be too much for my kids as well; especially for the younger one. we cross country ski it in winter but it's a climb. Still haven't taken my son up that trail, even on skis, because of it. But he easily hiked into Elk Lakes. You could always try taking a day trip just to the pass with the kids on bikes to see how it goes. Hi again Tanya - I was looking at the HI Hilda Creek Hostel. Your story and their site says it sleeps 6 but from the photos it looks like it could accommodate 8 assuming half the group are kids under 9. thoughts? thanks in advance! yes, the hostel does only sleep 6. We sometimes get away with 7 but to people have to share a bed. There are exactly three bunk beds. One of them is a double. So 7 max. And it's not like an ACC hut so you can't just squeeze extra people onto foam mattresses with it being bunk beds.